Passover seders are like children: Everyone thinks theirs is the most fabulous one in the world, yet we all have the good taste not to say so out loud. We had ours on Saturday, the sixth night of Passover, since I was away visiting my sister in Rhode Island at the beginning of the holiday. We were 24 in total, about the same size as usual, and we used the same home-compiled haggadah as usual. Even with so much continuity, every year is a little different. 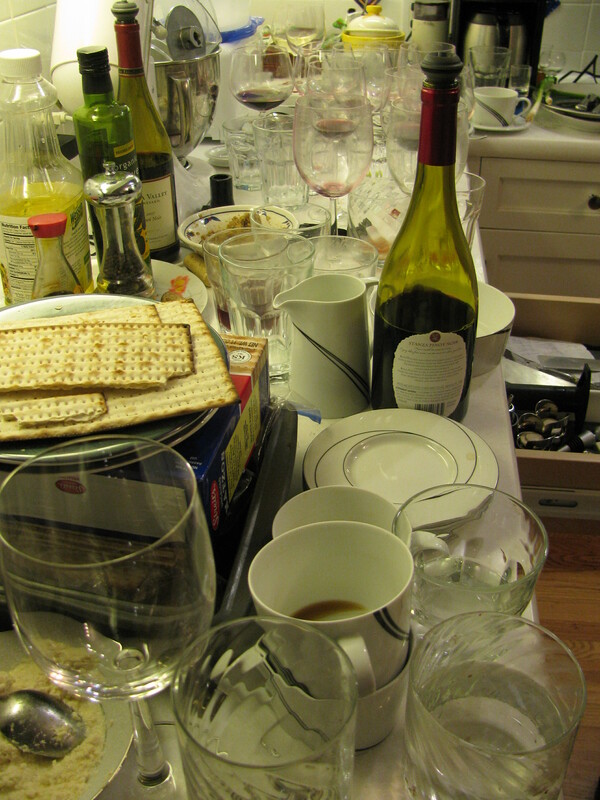 Before we had Becca, we did a longer seder with lots of discussing and digressing and politicking. Then we and our friends had babies, and it took on a beat-the-clock feeling: How much of the seder could you get through before the baby melted down? Then the kids got older, and there was often an empty seat while some little boy was off in the living room taking a Lego break. Now the average age of the kids has risen to somewhere between 10 and 16, and we’re able to have a focused, coherent seder once again. Let the scallion whipping begin! Now, I know that the point of a seder is the story – the exodus from Egypt, the collective memories of slavery, the vertical connection to our history as Jews and the horizontal connection to the freedom struggles of so many other peoples today. Okay, I know that. Now can we talk about the food? I am about to violate the basic rule of discretion that I laid out at the beginning of this post, but I must say that I make the absolutely best matzah balls in the world. You may scoff, but this verdict comes from the toughest of critics — my daughter, who is usually about as complimentary to me as Simon Cowell is to American Idol wannabes. They are light, fluffy, melt-in-your-mouth. 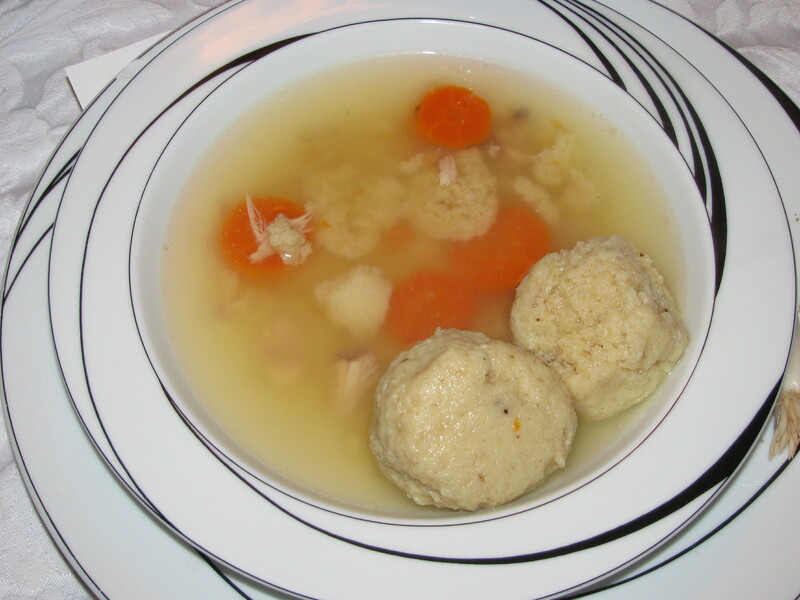 So even if I never get my novel published, I can take satisfaction in being Queen of the Matzah Balls. The dessert I’d made before was a raspberry jam linzer torte from a recipe by Tina Wasserman in Reform Judaism magazine a couple of years ago. 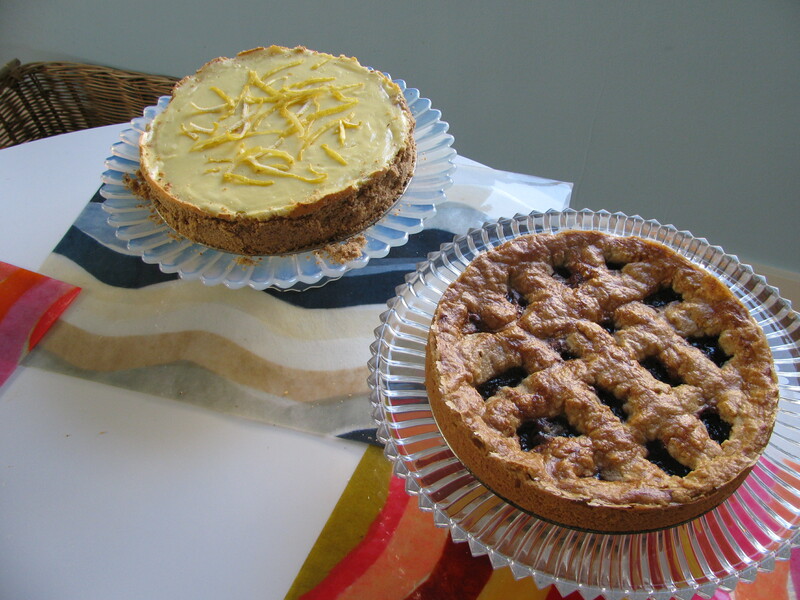 The new one was a lemon cheesecake from the web site of the late, lamented Gourmet magazine. As anyone who has had dinner at our house knows, Sam is the baker in the family. He makes apple pies, fruit tarts, éclairs, croissants, and pain au chocolat. I don’t go near anything that requires rolling out dough or letting things rise. But I have a personal passion for Passover desserts. Sometimes I fantasize about writing a Passover dessert cookbook. I love having to work within such strict, almost absurd limits. 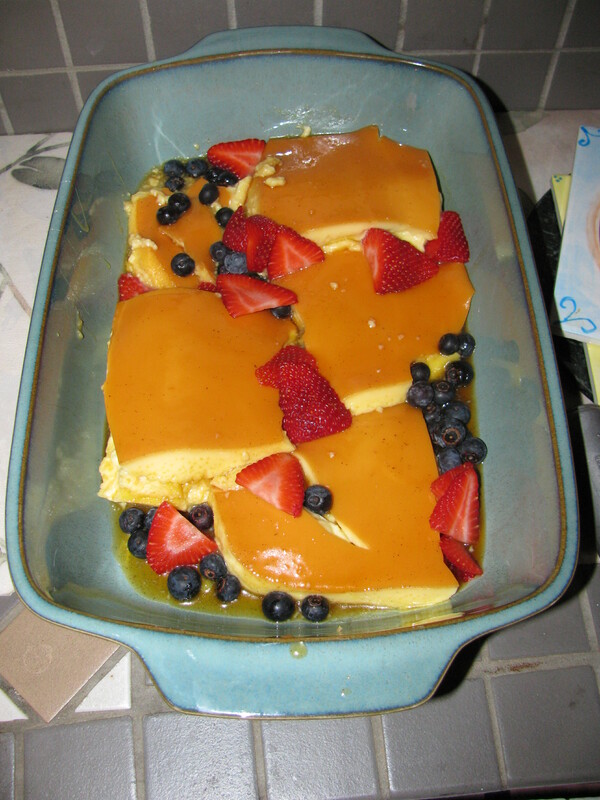 It’s one thing to make a main course without wheat or grains or leavening – but desserts? It’s kind of like Iron Chef: The Pesach Challenge. And there are so many bad Passover desserts out there. The old dry sponge-type cakes. The jellied fruit slice candies. The — I shudder even to think of them — canned macaroons. So I love the challenge of coming up with Passover desserts that are not dry and boring – that are modern and fruity and moist and scrumptious. The linzer torte and cheesecake definitely made the grade. So did our friend Jane’s chocolate death cake (only three ingredients — chocolate, eggs and butter) and our neighbor Lisa’s caramel and berry flan. 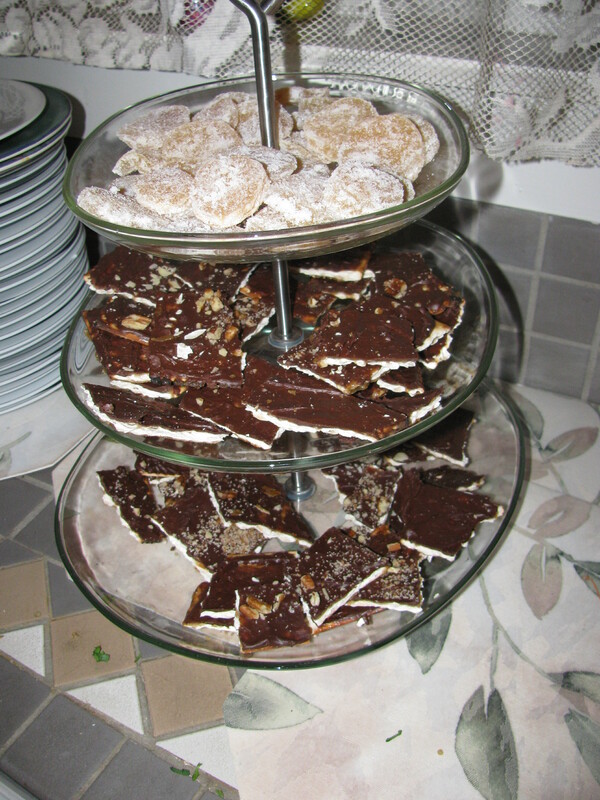 Then there was the chocolate toffee matzah, which I sometimes make but which last night was made by our friend Lynn. I quietly skipped the brisket that Sam made for the main course, knowing the desserts that would be coming. No loss. Today we’ve got brisket leftovers for dinner. But — sad for the soul, good for the thighs — the desserts are all gone. This entry was posted on April 4, 2010 at 1:48 pm and is filed under Judaism. You can follow any responses to this entry through the RSS 2.0 feed. You can leave a response, or trackback from your own site. 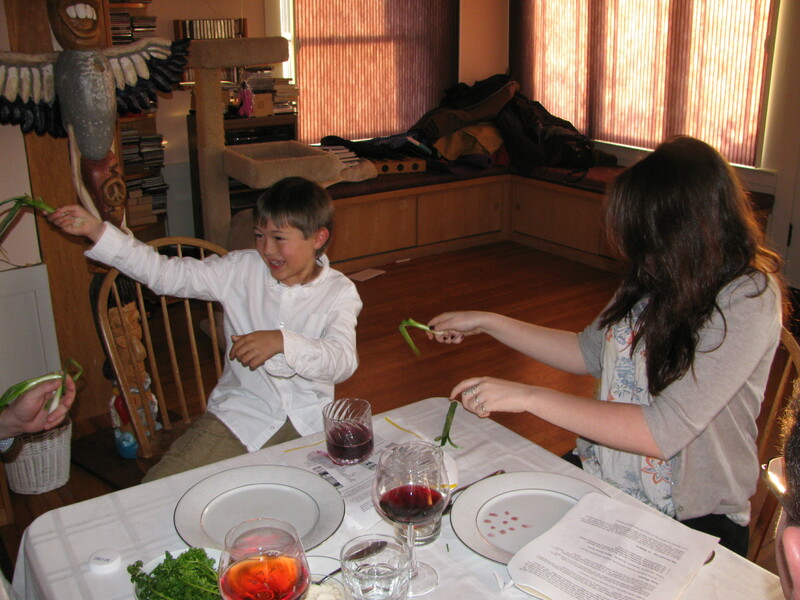 Ilana, I loved reading about your seder … I feel as if I’d been there myself! 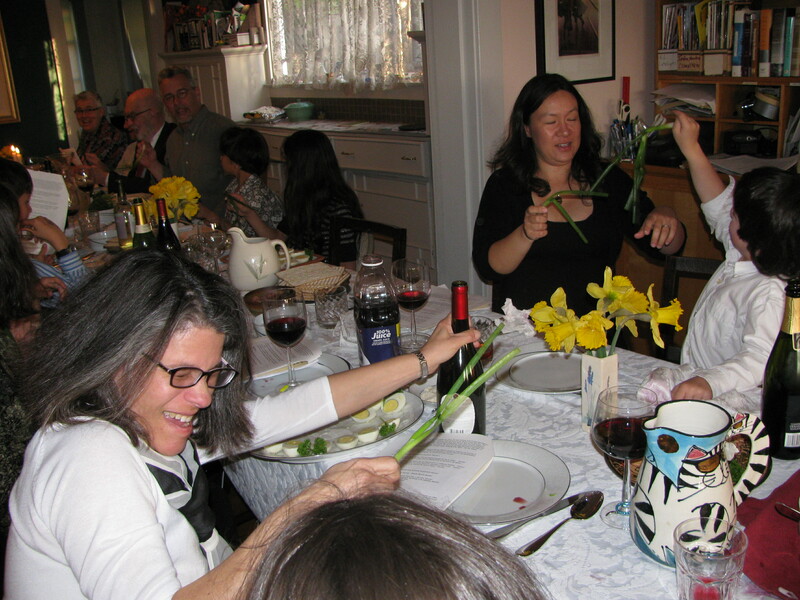 (I nearly forgot about the whipping scallions, which I encountered two years ago at the same seder I mentioned in my blog at which the four question were asked in various languages.) Your desserts look spectacular … I’ll have to try and find some of the recipes. 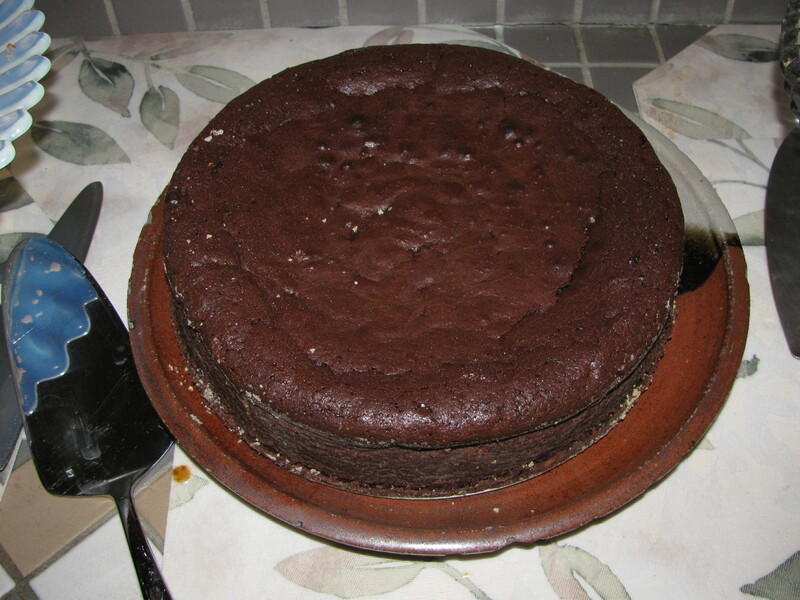 There are links in the post to the torte and cheescake recipes. They are very easy! Oh, can we come to your seder? Next year in Oakland is my prayer! We would love you to come! Seriously. Let’s follow up next, um, January or so??? Melissa: I am laughing my head off! Just thought of a solution: make-your-own strawberry-topped individual sponge-cakes … with a separate liqueur-spiked sauce to spoon on, for those who want to put it all together (and the killjoys can eat their strawberries plain). What about the new alternative Passover grain-quinoa? Heard it was a hit at the seder! Let me know if my apple cake makes the grade for the Passover dessert cookbook. Yes, your quinoa was a major hit! For those unfamiliar with it, quinoa (pronounced keen-wa) is a grainlike thing that is sort of like couscous. But I looked it up last year, and it apparently is not a grain — it is considered a sprout — so it can be eaten at Passover.